The PerTronix Bundle003 ignition kit is designed to provide maximum ignition performance at an enthusiast-friendly price point. 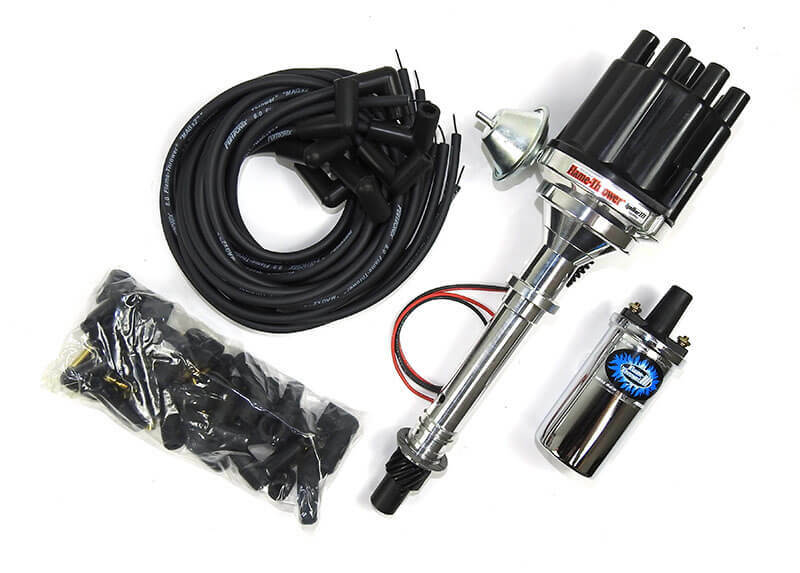 Kit includes a Chevy SB/BB billet plug-and-play Ignitor 3 (I3) distributor with black female cap, Flame-Thrower III chrome coil, and Flame-Thrower MAGx2 universal black spark plug wires with 90-degree plug boot ends. PerTronix’s I3 billet distributors ship with all-new Ignitor III multi-spark rev-limiting modules, which replace outdated points, electronic distributors, and bulky HEIs. Just install the distributor, connect two wires, and turn the crank! The I3 provides multiple sparks throughout the RPM range, with LED feedback, memory safe function, adaptive dwell for peak energy maintenance and reduced misfires, auto-adjusting spark timing at high RPMs, and reverse polarity and over-current protection. Coming in at 45,000 volts, PerTronix Flame-Thrower III coils boast an extra-low resistance, with a high-turns ratio and ultra-low primary resistance; together, these properties let the ignition system charge faster at high RPMs. Drivers will also enjoy a rapid charge time and full 50-state and Canadian legality (CARB E.O. #D-57-21). Finally, PerTronix Flame-Thrower MAGx2 wires feature factory-terminated ends for a superior connection and a perfect fit—no cutting, crimping, or splicing required—two current paths for redundancy-enhanced reliability; a temperature-, moisture-, oil-, and chemical-resistant 8mm silicone jacket; and reinforced fiberglass braid. Plug-and-play billet distributors designed for maximum ignition performance at an affordable price. Ignitor III multi-spark rev-limiting modules. Precision CNC-machined 6061-T6 billet aluminum housings are light yet strong. Hand polished and buffed to a high luster. Adjustable mechanical advance with proprietary limiting function permits multiple settings. Factory set with a performance advance curve, with additional springs for custom advance. Charges to peak current 30–70% faster than other coils. Two current paths for reliability and redundancy: primary spiral-wound stainless steel alloy and secondary carbon-impregnated fiberglass center core. 8mm silicone jacket resists high temperatures, moisture, oil, and chemicals. Fiberglass-reinforced braid for added strength and flexibility.